There is a considerable amount of information in respect of Early Years assessments with children assessed against three Prime Areas and seven Specific Areas. Below is a simplified table which presents the percentage of children who have achieved a Good Level of Development overall, across all areas, and the percentage who have achieved this in Reading, Writing and Maths. The comparison is with Gateshead Local Authority. It is important to note that the information does not present the baseline of the pupils (the level in which they were assessed at the beginning of Reception). Please note that all results are provisional until validated nationally. Due to the changes in SATs, for both Key Stage 1 and Key Stage 2, information is now very different to what has been presented in the past. Levels have been removed and been replaced with an ‘Expected Standard’ to meet. In Year 2, teachers will use both test information and teacher assessments to make judgements on the standards that individual children have met. The tables below show the percentage of children who have achieved the expected standard and the higher standard in each subject and in the three subjects combined. Within Year 1, the Phonics Screening Check assesses the ability of children to use phonics at the national standard. In Year 6, reading and maths is assessed through tests. This required standard is represented by children achieving 100+ on a scaled score. Those children who achieve 110+ are identified as working to a ‘High Standard’. A school will publish the average scaled score in each subject to indicate the attainment of the group as a whole although children will receive their individual scores. For writing, teachers will assess children against the set criteria and make a judgement based upon the criteria met. The progress measure for the children in Year 6 indicates whether the children, collectively, have made progress ‘below’, ‘in line with’ or ‘above’ expectation. A positive progress score indicates above, a negative score indicates below and zero would indicate expected progress. 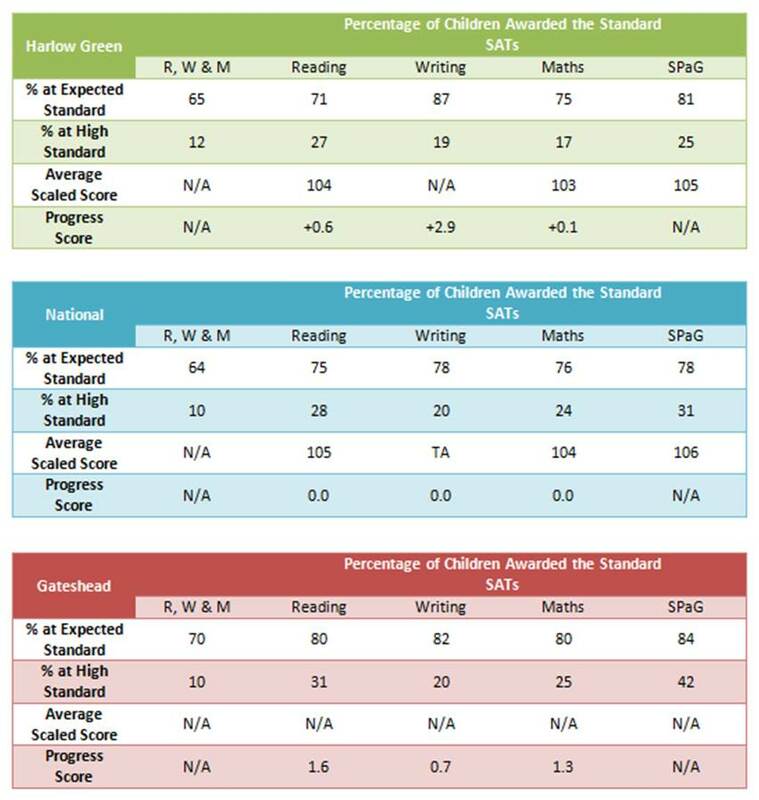 The provisional results below are what Harlow Green Community Primary School achieved in 2017 – for both KS1 and KS2 – and what the national results are for comparison purposes.